The STIHL RM 756 GS petrol lawn mower has been specially developed for tough, long-lasting use in a professional environment. With its 54cm/21″ cutting width and its 3-speed gearing, this professional lawn mower is designed to mow areas up to 3000m². The hybrid housing is sturdy and durable. The foldable, dual-comfort handlebar can be adapted to your body height, ensuring the most comfortable working position, essential when you’re mowing for long periods of the day. 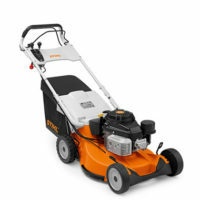 This model features anti-vibration elements which effectively reduce engine vibration, allowing you to comfortably use the mower for a full working day. With a 3 litre fuel tank for long running times coupled with the reliable and powerful Kawasaki engine, this mower is designed for large and tough mowing jobs. An 80 l grass catcher bag– made from tough fabric makes it easy to see when the grass catcher bag is full, whilst allowing excellent air flow to ensure the bag is filled to the brim. Each wheel can be adjusted independently to suit the lawn conditions, the alloy wheels also have premium, well sealed bearings for a long service life. The RM 756 GS comes with a 1 year professional warranty (subject to registration and servicing).